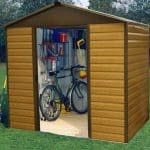 A basic security shed that is not costly, this building is a great entry level unit. It has galvanised steel throughout and an apex roof. The building also comes with a 15-year manufacturers warranty. 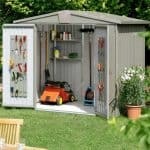 This is a metal storage shed that is also a security shed due to the fact that it has no windows. This gives added security and protection for the interior. The width of the building is 261.6 cm and the depth is 183.5 cm. There is a very smart apex roof on top of this shed and that roof provides a lot of protection when it comes to rainwater. Rainwater simply runs off a lot quicker than it would on other sheds, and this is a nice aspect. It adds value, obviously, and we were pleased to see it. 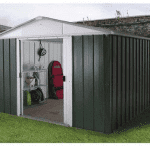 It’s a great-looking shed too, and a lot of that aesthetic value comes through the apex roof. The roof also has ventilated gables and these do a good job at keeping the building as smart and protected as possible. Ventilated gables are certainly not standard in garden buildings so it was nice to see these here. They help reduce the possibility of condensation and bring an overall extra level of climate control. One key aspect here that simply can’t be ignored is the positive fact that the walls are grooved. This brings in a lot more durability and adds plenty of value. This is a great layer to have, and when you consider the fact that the building also has galvanised steel throughout, it’s pretty strong stuff. This means that there is plenty of longevity here. It’s quite a lot of value for the low price tag. All of that is backed up by a 15-year guarantee against rust perforation. Again, we found this to be a real benefit when you consider the price of the product. The building is not supplied with a floor, or even a foundation kit. You can pay for a steel foundation kit and then get to work to fill up that foundation and create the flooring you need, but this costs nearly £80 extra. It would have been nice to have this included but again this is is not a pricey building, so maybe it is arguable that you should expect some extra expense. There is also another option that the manufacturers have brought in, with the ability to purchase a tongue and groove floor. This is only slightly more expensive when it comes to cost, and does provide a very solid floor that should definitely be considered. The building has been completely hot dipped in galvanised steel and as such does not require any treatment or maintenance. You just simply let it do what it needs to do. And that 15 year warranty is a great aspect that we think adds massive value. The sliding doors are excellent, and open up to a width of 106 cm. This gives plenty of value, and shows you that the manufacturers are actively trying to help the customer by providing plenty of access space. It’s a great part of the deal. There are no windows due to the fact that this is a storage shed that also presents as a security shed. The lack of windows makes a huge difference, and that means you have that ideal level of security right from the outset. You can purchase a padlock as an extra. A padlock if you need it, and a special ground anchoring fixing kit for extra stability. We think they are worth buying just to add that extra bit of security and value. 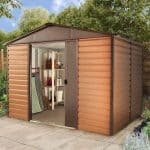 Final Thoughts: It’s a basic storage shed. We think it is tough and secure, and the grooved walls certainly help to keep things stronger. 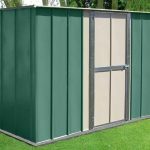 But you also get that galvanised steel effect, which cannot be overstated when it comes to the level of strength and stability you have. The 15 year guarantee makes the low entry price worth it, and you also have a chance to add a little bit of customisation in flooring. It’s a minor gripe when it comes to the lack of flooring, because the price really cannot be argued with. 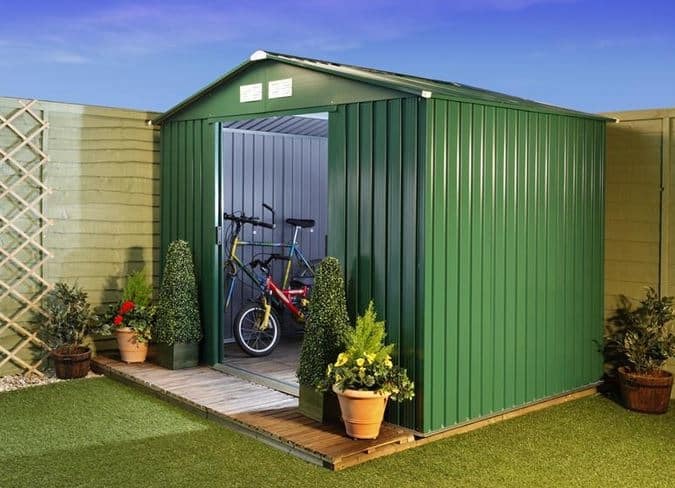 A great value shed.